Defence Secretary Michael Fallon launches 2016’s Reserves Day with 100 Reservists and their employers. Defence Secretary Michael Fallon has officially launched 2016’s Reserves Day celebrations at a recognition reception, attended by more than 100 Reservists and their employers. 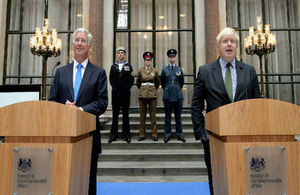 Hosted by Foreign Secretary Boris Johnson, demonstrating the government-wide appreciation and commitment to Reserve Forces, the event sought to recognise Reservists for their outstanding contribution to their country. Their employers were also acknowledged for the exceptional support they provide. We owe our reservists – and their families and employers – a debt of gratitude. In the last fifteen years almost 35,000 have served on operations, making an immense contribution. In a darker and more dangerous world, they give us the cutting edge, the specialist skills and the ability to swiftly adapt to new and emerging threats. Mr Fallon was joined by more than 100 Reservists from both the civil service and the private sector. A variety of industries were represented by organisations including: National Express, the Scottish Ambulance Service, HSBC, Vodafone and BT among others. Reservists serve across the Royal Navy, Army and RAF, balancing their civilian life with a military career by training in their spare time. In recent years Reservists have supported operations worldwide including in Afghanistan, Northern Iraq, Cyprus, Bosnia and Herzegovina and as part of the UK’s effort to counter Ebola in Sierra Leone. They bring a range of skills from their civilian lives into their military roles, while their military training provides them with transferable skills and qualities for their civilian lives and employers. This year saw the 1000th signatory from the private sector to the Armed Forces Covenant. Employers sign the Covenant to make a public commitment to the Armed Forces Community, including by offering support and flexibility to their Reservist staff, highlighting this government’s commitment to Reservists and all service personnel. I have seen first-hand the incredible job our Reservists do. They play a key part in all three of our services, and a huge role in protecting the United Kingdom’s security both at home and abroad. Their work, however, often goes unrecognised, so it is an honour to celebrate and thank the men and women who give up their time to serve their country.